Great company to work with - and the only one that actually responded to my query promptly and had an estimate to me within a few days versus weeks. Kary was very responsive to all my questions and was completely upfront and honest about what needed to be done versus what could be done and this was much appreciated. Communication was just excellent as we had a few weather delays. Allen, the installer, arrived when they said he would and did a superb job on the house as well as fixing an issue on the garage. The site was left spotless and we now have not only good looking eavestroughing, but ones that actually work properly! Will definitely be using Mega again. Thanks so much for the excellent review. We are thrilled to hear you are happy with the work and service, it was a pleasure working with you on this project and look forward to potential future projects together. Thanks again! Chris installed our Trane XR16 three years ago. The unit decided to stop working in the middle of this years' heat wave. After a recharge of refrigerant, we discovered that there was a major leak. 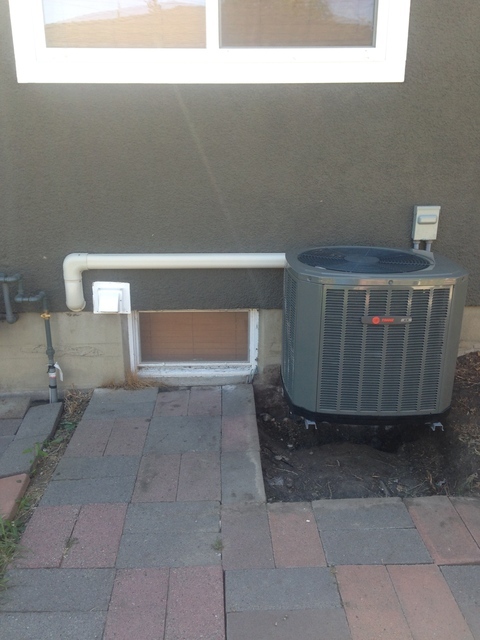 Chris's preference was to simply replace the whole unit given how young it is but the Trane distributor here in Calgary refused to stand behind their product and insisted on only adhering to the warranty terms, which included Chris charging us for his time to repair. Being the kind of guy he is, he didn't and promptly went out to buy two portable units so we wouldn't be without AC during the hottest period of the summer. The only reason he had to do this was because the Trane distributor didn't have any parts and it took over two weeks to get them from the US. We can't thank Chris enough for what he did for us and the way he stood behind the product he had installed, unlike the manufacturer. If you need a quality, honest and professional company to deal with, Williams HVAC is simply the best. As for Trane products, we'll never use them again and there's a good reason why Williams HVAC doesn't either! Very prompt response to our email with the service completed only a few days later. The job was very nicely done - the windows look awesome and the gutters are now doing what they're supposed to be doing. We'll definitely be using Eisses Windows again. Fantastic, thanks John! So happy we could help you out. We can't say enough about this company. Peter and Clayton came up with an excellent design for our backyard where everything has been thought through to the finest detail. They have been very flexible and accommodating with our requests and changes to both schedule and scope. The whole process really has been a two way street which we greatly appreciate. Peter and Clayton know what they're doing and offer great advice on what will, and won't work. The work that the crew does is exemplary and the attention to the smallest detail shows in the final product. The crews on site have been excellent and have had so much influence on our 2 year old daughter, that we've had to get her a toy Bobcat! Although we've only completed the first phase of our complete backyard makeover, we wanted to post this review as we are very, very happy with what has been done so far! Wonderful to hear, we are looking forward to the next phase, in the meantime glad your daughter has a lawn to play on! What a pleasure to deal with Andy and Manon. We had a bunch of minor repairs/modifications that needed to be done to some faucets and hose bibs and Andy did them quickly and properly. Great communication from them both and Andy turned up early both times he came out. We'll definitely be using Ducky's again for any plumbing issues that we may run into down the road. Many thanks for the review. We greatly appreciate the feedback. Communication and service are very high on our list to satisfy our customers. Should the need arise, we look forward to helping you out again in the future! Thank you for choosing Ducky's Drains! The ratings on Homestars for this company are well justified. We needed to have three of our basement windows replaced and Rick from Old West was the only company to actually turn up on site, when he said he would and actually measured the windows. Installation by Kyle and his crew was fantastic, fast and they left the site super clean. A misunderstanding about the scope of the job was cleared up super quick and with great professionalism. The finishing touches on the trim by Cory and Mike were top notch and we noticed an instant warming in the basement once the work was complete. We highly recommend this company - they're responsive, professional and do a superb job. We'll certainly be using them again for some egress windows and a door replacement. We found Chris on Homestars and his estimate to install AC in our 1959 bungalow was competitive with the other estimates we had. The differentiator for us was that with Williams HVAC, you are dealing directly with the owner. Chris knows what he's doing and took the time to explain the options and the best way to do the job based on what we wanted. Where Chris and his crew absolutely excel is in the high quality, clean and tidy work that they do - Chris and his crew clearly take a lot of pride in doing a good job the first time and it shows in the workmanship. I'm typically hard to please, especially with little details, and I couldn't be happier with the work Williams HVAC have done. We'll definitely be using them for a garage heater and all our future HVAC work. Thanks for the review John, look forward to working with you in the future! We have one word for Derrick and his team - excellent! Derrick goes well above and beyond to deliver a great service and of course, a great garage. His communication is amazing and we were involved in every step of the process. Derrick made the whole process very easy with no surprises. The pride he takes in his work is obvious and we are very happy with the final product (and the neighbours are quite jealous!). If you're looking for a quality built garage, built by a guy with high standards and integrity, Derrick is the builder for you. Thank John. It was great working with you as well. It's always a treat when the customer is involved in the build as you were. Leaves nothing up to chance. It's been great to see your backyard develop to what it is now! We have nothing but positive things to say about National Star Contracting. From the initial visit to the final inspection, Sokol and Ilir have provided nothing but first rate service and communication. Everything was done on time, on budget and the clean up left the yard cleaner than before they started! I particularly appreciated that they both took the time to explain to me exactly what products they use, how they use them and why. As a result of this focus on detail, the job that National Star did on our roof is absolutely fantastic and of the highest quality - this company prides itself on doing things right and the attention to even the smallest detail shows in the final product. As an example, Ilir spray painted our furnace stack, for no extra charge, so that it would match the roof colour. If you need high quality roofing work done at very competitive pricing, I really wouldn't look anywhere else. We highly recommend National Star and will be using them again in the future. Thank you for the detailed review and referring us your work-mate, whose roof we are doing in a couple of weeks. Let us know if we can help in any way. Paul was on time, informative and gave a very competitive price for the removal and stump grinding of 6 trees plus a couple of shrubs. He also gave great advice on how to rescue (aka tame) a couple of shrubs that had got out of control. The work was done on time and in a very professional and careful manner. Communication throughout the whole process was excellent. Highly recommended. We will be very glad to serve you again.